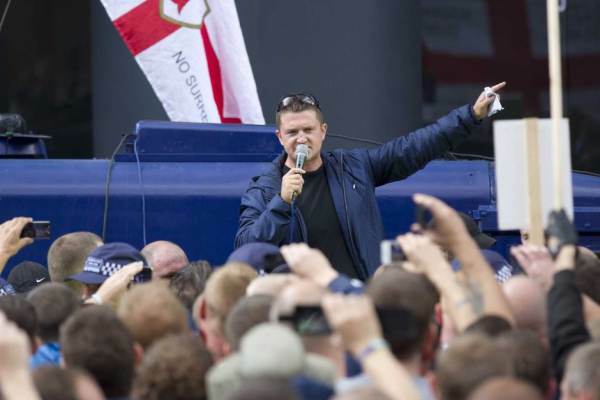 As TGP’s Cassandra Fairbanks previously reported, UK activist Tommy Robinson was arrested on May 25th for suspicion of breaching the peace while livestreaming to report on the trial of a child grooming gang and will now have to serve a prior 13 month suspended sentence. Paul Joseph Watson reported earlier today that Tommy Robinson has been moved to a maximum security prison with a 71% Muslim population. Inmates were banging on the cell walls shouting death threats! Coalan Rob, Tommy’s spokesperson, went on with Alex Jones on Wednesday to discuss the latest updates. An imam has placed a hit on Tommy Robinson. Coalan Rob: As soon as he arrived he was told there are people here who don’t like him. He was put on the main wing which is central main heart of the prison. It’s not solitary it’s the main open season(?) part of the prison… And that was where he was put. We found specifics of the prison. It is around 71% Muslim. This is really, really, really disastrous. The last one was close to 2%. As soon as he arrived he looked around. He could see people shouting. It’s really, really quite terrifying. He went to his cell. He said all night people were shouting and banging on his door, screaming death threats… We also have there’s been a hit by an imam on him directly.